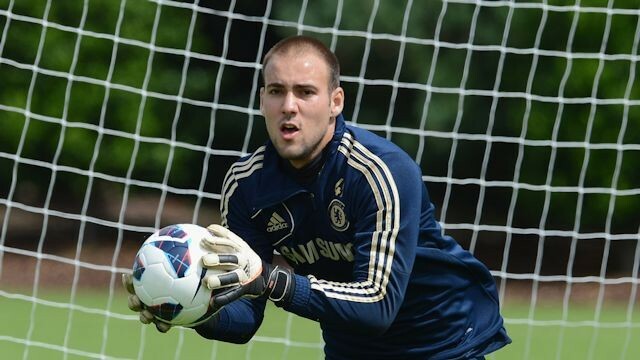 Goalkeeper Matej Delac, who joined Chelsea in 2010 is officially Chelsea’s longest-serving player. The former Croatia Under-21 star, who is now aged 25, has never been registered for the Premier League due to work permit problems. Matej Delac who is currently on loan at Belgian club Mouscron has agreed on a deal to officially leave Chelsea and join Danish Superliga club AC Horsens in the summer when his Chelsea contract runs out. Delac had ten loan spells away from Stanford Bridge, He joined Chelsea from Croatian club NK Inter Zaprešić in 2010 on a five-year deal, a year later he was sent to Dutch club Vitesse for his first loan spell and ever since he has been on loan at ten different clubs. A very complicated work permit issues have ensured that Matej Dalec cannot play for Chelsea, although he might not have played a single game for Chelsea he is officially the club’s current longest-serving player. “This summer, people at the club told me that, we had a good laugh. Yes, it is a little strange but it is all football. Over the past few years, Terry, Ivanovic, Cech, Mikel and other experienced players have left the club so I have been here the longest! Matej Delac this week signed a two-year contract that will keep him at Danish club AC Horsens until the end of the 2019/2020 season. Delac told the club’s official website: ”I’ve heard very well about the Danish league and I really like AC Horsens, where players, staff around the team and other people from the club have taken good care of me. ”I have had some good conversation with Peder Hansen and Bo Henriksen, and I look forward to working with them. “My best experience in Chelsea? There were moments I will remember for life, such as my only appearance for Chelsea, 45 minutes vs Olimpija in Ljubljana,” he recalled. “You know, I can’t get a work permit in England, that is why I can’t go on loan to an English club. We all dream of playing in the Premier League, but it is not possible without a work permit. Delac also praised Blues’ manager Antonio Conte. “Delac added: “Conte is a great worker, professional, even when Chelsea is not doing well.